The other three images depict the newly discovered south polar vortex in the atmosphere of Titan, reported recently by Cassini scientists. 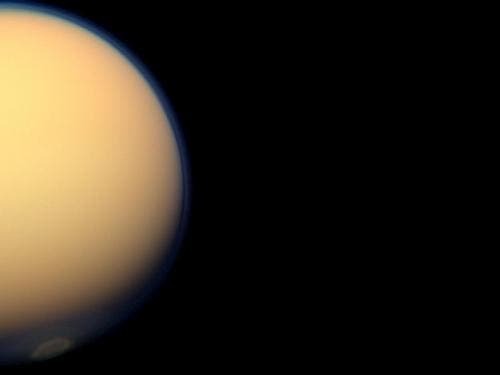 Cassini's visible-light cameras have seen a concentration of yellowish haze in the detached haze layer at the south pole of Titan since at least March 27. Cassini's visual and infrared mapping spectrometer spotted the massing of clouds around the south pole as early as May 22 in infrared wavelengths. After a June 27 flyby of the moon, Cassini released a dramatic image and movie showing the vortex rotating faster than the moon's rotation period. The four images being released today were acquired in May, June and July of 2012. Cassini's newly inclined — or tilted — orbits allow more direct viewing of the polar regions of Saturn and its moons. 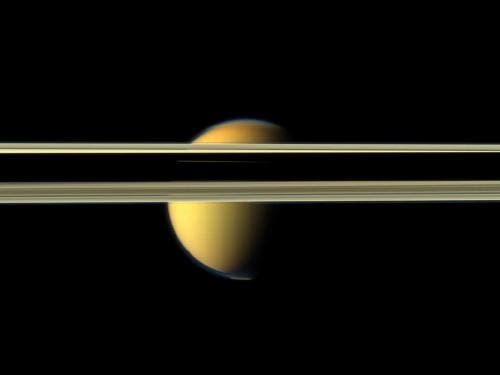 Scientists are looking forward to seeing more of the same — new phenomena like Titan’s south polar vortex and changes wrought by the passage of time and seasons — during the remainder of Cassini’s mission. 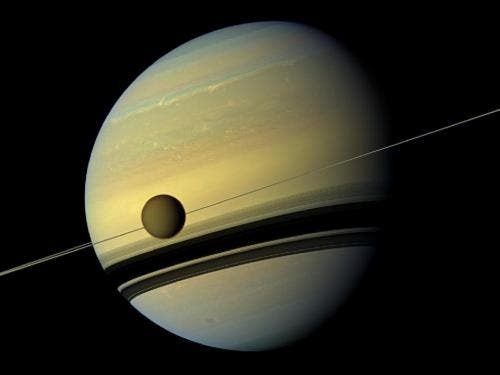 “Cassini has been in orbit now for the last eight years, and despite the fact that we can’t know exactly what the next five years will show us, we can be certain that whatever it is will be wondrous," said Carolyn Porco, imaging team lead based at the Space Science Institute in Boulder, Colo.Launched in 1997, Cassini went into orbit around Saturn on July 1, 2004. It is in its second mission extension, known as the Solstice Mission, and one of its main goals is to analyze seasonal changes in the Saturn system.